Brian spent most of yesterday at his 'cousins' farm. OK, they don't really live on a farm...they just have a few farm animals. For a few more days anyway. Nico's class at school hatched baby chicks, and then had a drawing for the chance to bring them home for a short time before taking them back to the pet store. Nico won the drawing and brought home a cute, teeny tiny baby chick. In the morning, he woke up to find that the teeny tiny baby chick had drowned in his water dish. 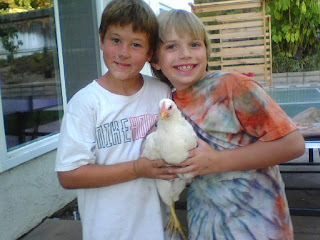 Being the perfect parents that they are, Nico's parents ran out to buy him a new chick, and were soon talked into a pair of chicks. Which they were to keep for a short time. Fast forward a few months, after moving them from a box in the play room to a dog run in the side yard, the teeny tiny chicks grew up. One became a chicken (see above) and the other became a full fledged rooster. Like clock work, every morning. Yesterday morning, the police showed up at their door because apparently it is against the law to have a rooster in your garage. The chicken and rooster now have until Monday to find a new home. Over chicken nuggets at McD's, Brian told me just how sad he was.